Inc Solutions Lite is an ideal starter pack for small companies or individuals wishing to create an instant HotSpot. The equipment consists of our own designed all in one gateway that simply connects to an existing ADSL line. You can have your HotSpot operational in minimal time ready to offer high speed wireless access to your customers and generate you revenue. 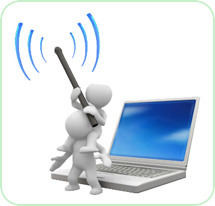 Wireless coverage can be expanded by installing additional access points. Everything is done for you. We can also provide your Broadband ADSL Connection. Subscribers are blocked from viewing other computers connected to the system and are limited to the bandwidth associated with the voucher or payment ensuring no user abuses the connection. Inc Solutions LITE is added to our Network Operations Centre remote monitoring program, which means that we know when there is a problem with your system, sometimes even before you do. In the event of a system alarm our engineers can log in remotely to diagnose and repair the problem. We can even provide you with system uptime reports so you know just how reliable our systems are! Inc Solutions Lite returns a great rate of revenue to your business, far in excess of other HotSpot providers. Simple, secure and cost effective, Inc Solutions Lite is the easiest way of creating a HotSpot in your business.